Unveiling of Honor Roll and Machine Gun, At Morongla Creek. The above important function eventuated on Friday evening last in the Mechanics' Institute, and was witnessed by a large gathering of people. Mr. H. Adams as chairman called on the Rev. Jas. Barr to unveil the Honor Roll, and the rev. gentleman in doing so said it was one of the proudest positions he had ever been placed in, and it gave him the greatest pleasure to comply with the chairman's request. He congratulated the Morongla people on the step, they had taken in erecting the roll, which would stand, for all time as a monument to the brave men of this district who answered the call. The returned men present stood to attention while the Union Jack was drawn aside and the National Anthem sung. 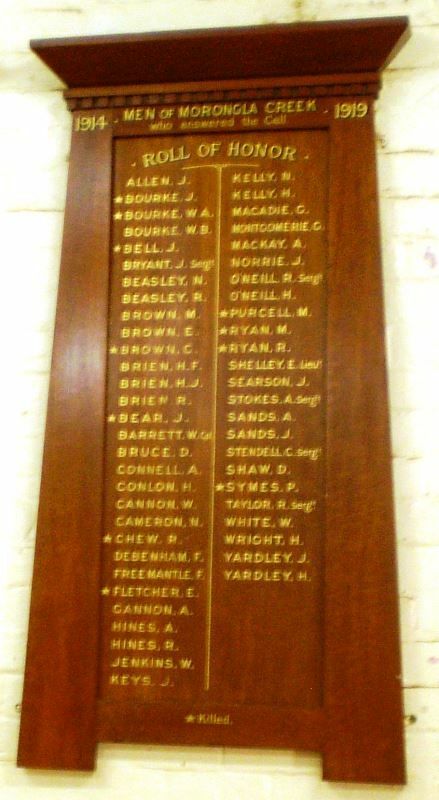 The roll, which cost £15, is of polished Queensland Maple and contains 54 names, 11 of which have; paid the supreme sacrifice. It was greatly admired by all present. Cowra Free Press (NSW), 11 December 1920.